Some of the free stuff I collected at the NY Art Book Fair. 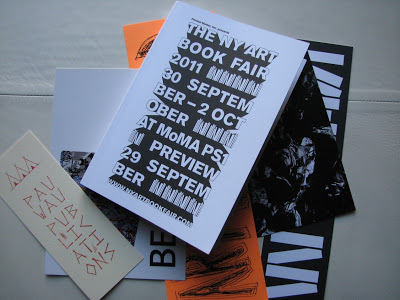 Last night I went to the preview for the 2011 NY Art Book Fair at MoMAPS1 where I got more cool bookmarks than I’ll ever need. 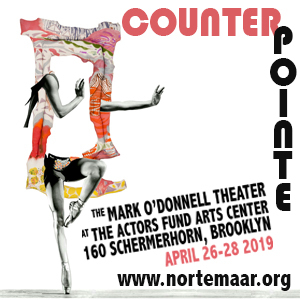 Presented by Printed Matter, the fair features more than 200 international presses, booksellers, antiquarian dealers, artists and independent publishers from twenty-one countries. 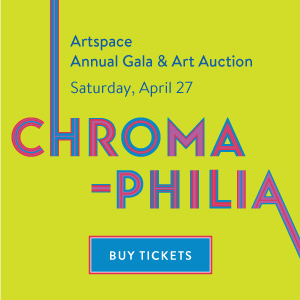 This year’s focus is on artists’ photography books (look for blogger Alec Soth‘s outfit, Little Brown Mushroom Books), and in an outdoor tent in the courtyard, more than 60 zinesters have set up shop. 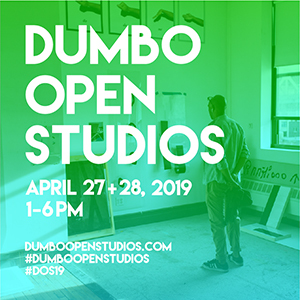 Incredible artists’ books, contemporary art catalogs and monographs, art periodicals, and artist zines fill two floors in the old brick schoolhouse, and admission is absolutely free. Don’t miss REDFOXPRESS where Francis Van Maele has been printing limited editions in his silkscreen studio since 2000 at Achill Island on the west coast of Ireland. 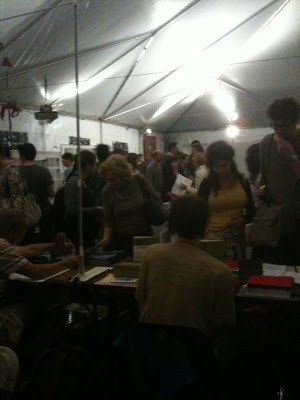 At the Booklyn Artists Alliance table make sure to check out the big James Siena book that goes backwards and forwards. And if you touch the big book that’s made of canvas, they’ll give you a free book of haiku. BAA is an artist run non-profit organization that publishes, distributes and produces exhibits of limited edition artist books and works on paper by artists like Xu Bing, Kottie Paloma, Raymond Pettibon, Iggy Scam, James Siena, Jessica Stockholder, Roland Tiangco, Mark Wagner, Scott Williams and more. Overall, if you like to fondle beautifully bound objects full of thought provoking words and images, don’t miss this exhibition. It’s inspiring. I got some great ideas for new projects for Two Coats of Paint Press, which recently released artist proof versions of Sketchbook 1 (2007) and Sketchbook 2 (2008-10). The 100-page sketchbook volumes, which were created as part of an exhibition I had at TowerBrook Art Project this summer, are culled from 1000 pages of sketchbook drawings and collages made from 2007-2010. I’m looking forward to producing more books in the coming year. Everyone should be making books–start your own press! 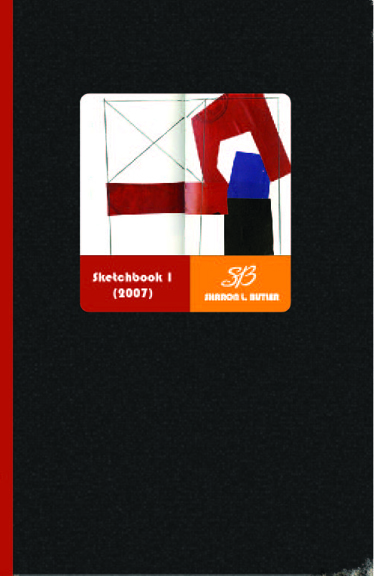 Sketchbook 1 (2007), 9 x 6″, full-color, 104 pages. It looks just like one of my sketchbooks. 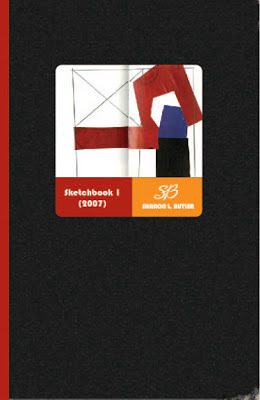 UPDATE (October 1): Final versions of the sketchbook volumes mentioned above have just been approved and are available here. This is an article I wrote in The Brooklyn Rail a few years ago (before I started Two Coats of Paint Press I think) about how artists are using on-demand publishers to create and distribute artists books.